San Antonio is rich in its cultural practices, due to its high Latino and Hispanic population. The store I went to had an upstairs with more normal, touristy type items but I quickly discovered that they had a downstairs basement filled with every iconic statue and item necessary to practice one’s religion. I was also lucky enough to be there at the height of preparation for Day of the Dead. Skeleton keys have long been used as protective amulets and charms. 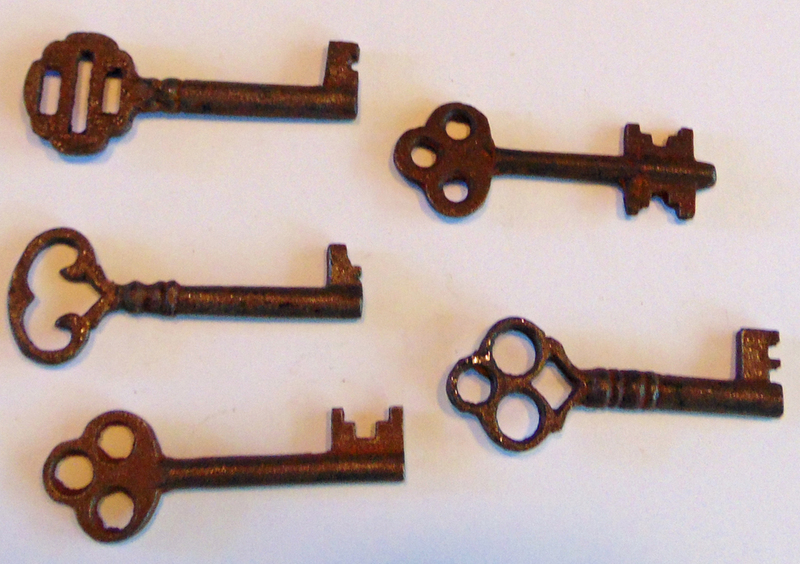 Real skeleton keys are from the early 1900’s and are a bit rusty and oily due to age, use and storage. Zora Neal Hurston, in “Mules and Men” tells a story about how God gave Eve the keys to the nation to control how much power Adam had over her (and how much abuse he could dish out to her). In the story, these keys kept the balance of power between a man and woman. A key in the hands of woman doing magic is a powerful thing – locking up a man’s nature, keeping them home with their family and responsibilities, keeping them tied to them. But the feminine connection with the key does not end with Hoodoo folk magic; keys are used in fertility spells, protection for a baby to keep them from begin stolen by fairies and many other healing spells. When I saw these real skeleton keys in that San Antonio shop, I was obviously ecscatic and over the top about it. In general, if I can find something locally, it’s better, and the fact that I just happened to come across these keys by accident tells me that I was meant to have these five, at that very moment. To the spirits, I am very grateful for leading me in this direction. I wish I could remember the name of this shop, but I can say that it was near the Menger Hotel, which is known in San Antonio to be a haunted hotel.